Swype, for a long time my favourite keypad to use on Android phones which I first encountered on my Samsung Galaxy S back in 2011, has been killed off after years of slow development by Nuance, who bought it out in 2012. 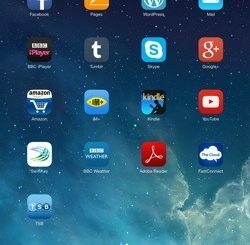 The announcement was made at the start of this month but has only just been picked up by the tech media which some might say demonstrates why its owner felt the need to discontinue it. Swype was the original keypad that let you trace words by moving your finger from letter to letter without removing it from the screen; other keypads just predicted words as you tapped on letters (you might recall that iOS lacked even this until version 8). Nuance is best-known for its Dragon dictation and voice-control software (widely used by quadriplegics who cannot use their hands to control their computers) and a version of this was included with Swype which for a while was branded “Swype + Dragon”. However, Nuance was a relative minnow once SwiftKey, its major competition among ‘independent’ Android keypads, was acquired by Microsoft, Google improved its own keypad and both were offered for free on the app stores. I’ve used SwiftKey on and off since I had my first Android phone, an HTC Hero (branded T-Mobile G2), in late 2009. SwiftKey was a vast improvement on the bundled keypad and its predictions were really fast and accurate, which the HTC keypad’s weren’t. Swype was also a revelation when I first saw it on the Galaxy S; it came bundled with the phone as part of Samsung’s OS and was not available independently then, so when you upgraded to the now-defunct CyanogenMod because Samsung would not update their own Android offering for that phone, you lost it. But SwiftKey was still a good choice, it still had fast predictive text and it also copied Swype’s tracing method of typing, and improved it, predicting as you swiped. But SwiftKey never copied some of Swype’s best features: the ease of copying and pasting using gestures that copied standard key combinations (e.g. swiping from the Swype logo to C, X, V or A as shown in the picture) and its handling of common English apostrophe-letter endings (’s, ‘d etc) — you’d just trace from the apostrophe to the letter or letters. SwiftKey forced you to enter them manually and still does. It also has not been very good with hyphenated phrases; again, it would treat them as single words while Swype knew they were joined words. I always thought Swype was the visually most elegant keypad app on Android; the themes were often understated with good contrasts. However, the performance of the app slowed with use and development appeared to slow with it; no major new features were added for a long time and very few bug fixes. The iOS version was never comparable with the Android version, only ever offering three word predictions for example and having fewer ‘learning’ options. At the same time, GBoard improved somewhat (although I always found it awkward to use compared to SwiftKey or Swype), SwiftKey introduced Flow and Google Keyboard introduced a Swype-like trace-typing method; neither were as good as Swype at first but got better. 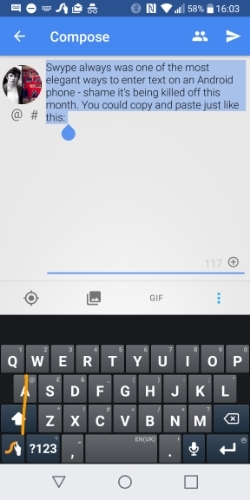 GBoard (as it is now known) was introduced for download on phones that came with third-party keypads; SwiftKey became free of charge and then so did all the themes. Swype just couldn’t compete with bigger companies giving away the thing it invented for free.